Because what our students bring to the table is indispensable. Acero Schools is working diligently to lead in both dual language acquisition and culturally relevant curriculum. The 2018-2019 Acero Schools Academic Calendar is here! We are already so excited about next year! Please find the Acero Schools 2018-2019 Academic Calendar here. Acero Annual Art Festival May 26! Join us for Acero's Annual Art Festival on May 26 at Soto High School!! 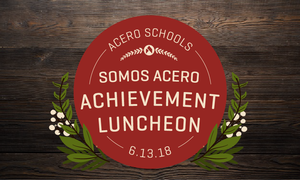 Join Us, For the First Annual Somos Acero Achievement Luncheon! The Go CPS Round 2 deadline has been extended to Sunday, May 6 at 11:59pm for online applicants. Paper applications must still be received by CPS’ Office of Access and Enrollment no later than today, May 4th, at 6 pm. La fecha límite para la segunda ronda de solicitudes ha sido extendida hasta el domingo, 6 de mayo a las 11:59 de la noche para solicitantes por internet. Solicitudes en papel aún deben ser entregadas a la oficina de acceso y matriculación de CPS antes de las 6 de la tarde hoy viernes, 4 de mayo. Idar Pumas Are Girls Basketball Champions!